A hollow container similar to a vase, covered with a lid, which is often used as both a decorative piece and a receptacle. The term urn usually refers to funerary vases used for containing the ashes of a deceased after cremation, but it can also indicate a vessel for serving liquid, especially tea (such as a samovar). Urns are made ouf of a variety of materials such as clay, silver, or brass. 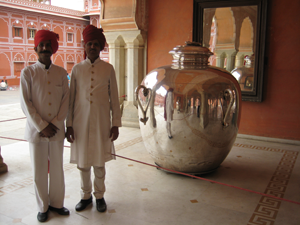 The largest silver urn in the world, Jaipur, India, image taken March 11, 2008 by snikrap, is licensed under CC BY. N.d. Samovar. http://www.britannica.com/EBchecked/topic/520631/samovar, accessed October 6, 2014. N.d. Urn. http://www.merriam-webster.com/dictionary/urn, accessed October 6, 2014.